The Southern Cape of South Africa is home to one of the most critically endangered vegetation types on earth – FYNBOS. The Cape Floristic Kingdom is the smallest and most critically endangered of the six floristic kingdoms in the world and is endemic to the Southern Cape of South Africa. Gondwana and the GCF focus on the rehabilitation and promotion of biodiversity for all eco systems in the Southern Cape. Fynbos is neither a type of Protea nor a single kind of bush. It is the term given to a collection of plants that are dominated by shrubs and comprises of species belonging to Southern Africa’s southwestern and southern regions adjacent to the coast. Three shrubland types can be broadly categorized as belonging to the fynbos region. These are: true fynbos, renosterveld and strandveld. Renosterveld, a shrubland, grows on relatively rich soils; hence, most of it, especially on the coastal forelands, has been ploughed for wheat and other artificial pastures. Due to excessive exploitation from agriculture Renosterveld is critically endangered and only small fragments remain. Strandveld also a shrubland, grows in alkaline sands along the dry coasts of the region. Shrubs, small trees and succulents dominate the vegetation type. Because of its succulent nature, this shrubland rarely burns. 67% of South Africa’s threatened plants occur in the fynbos biome. This is due to the limited distribution of the species. 596 fynbos species only occur in one place, such as a single mountain top peak, valley or wetland. Habitat loss is historically the single largest cause of species extinction in Fynbos. 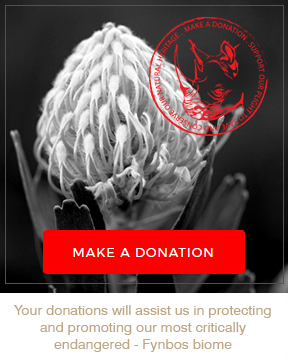 Cape Sugar birds are the most important bird pollinators of fynbos proteas. Fynbos is home to three specialist nectarivorous birds: the orange breasted sunbird, the malachite sunbird and the lesser double-collared sunbird. It is no exaggeration to say that without fire there would be no fynbos! The best way for seed to be protected against fire is for it to be underground. Special fleshy attachments on the seeds of certain species encourage ants to carry them underground into their nests. Fynbos soils are infertile due to the nutrient deficient rocks from which they derive. The dominant rocks associated with these poor soils are quartzite and sandstone. Most fynbos soils are whitish, acidic sands (having a low PH) that are both shallow and rocky.